Hi guys, Well the weather generally has been good quite of late and the river has seen a few more locals hitting the river compared to recent weeks but all you outsiders seem to be staying away for one reason or another. There are hardly any serious anglers about which spend all day on the river and quite a few trout scattered through out the river so why are you not here?? We are obviously still in spring and will be for some time yet so we will have to put up with the weather doing what it wants for a while yet and although we remember most of the bad days where we cant cast a line due to 7oknot winds and soaked to the bone due to a flash down pour we do receive some lovely days which you could not fault. I think they have forecast a pretty good weekend coming which should drag a few out of the wood work to wet a line again. The changing of the seasons can be interesting fishing at this time of year and confusing knowing what to put on next as they will still take glo bugs but instincts tells me small naturals or even to try a dry of some description. I was chatting to my mate last night Mike Hughes and we spoke about the fishery and what the winter fishery has done for him this year and he actually has decided that he had a better winter fish year last season. He caught less perfect condition fish over the past 4 months compared with other years but admits he may have caught a few more fish his year. I disagree with Mike on this one and like many other anglers tend to think that I saw and caught more better conditioned fish this season and witnessed larger pods of fish coming through when they were running. Everyone would have a view on this one and I should imagine it would be influenced by individual success while on the river which is the only true way to get out and make assumptions for yourself. 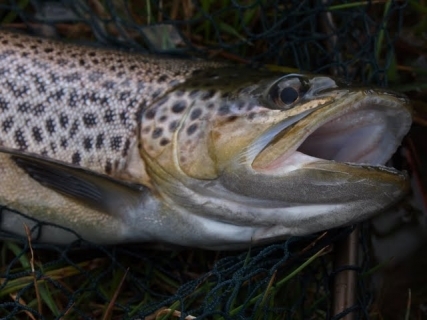 Local newspapers have reported plenty of good fish being caught in the lake in the past couple of months with 90% of fish having smelt inside them which should put weight on these fish very quickly and set up a good season next winter in the rivers. It is fantastic to hear of smelt in numbers again in Lake Taupo as this is the food source which really improves the size and quality of trout in the lake, take a look at the smelly group of lakes in Rotorua they all have plenty of smelt. 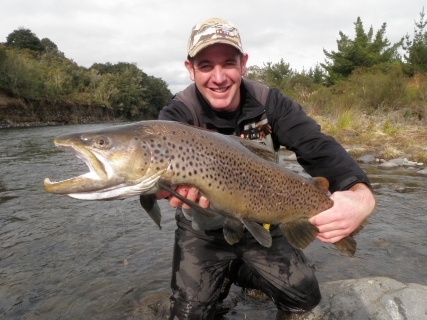 Another conversation which Mike and I have regularly is the arrival of the big Browns in the Tongariro as we love hunting these fish as they are a real trophy to catch due to their power and size. There is not one brown that fights the same nor look the same they all have very individual personalities which are generally wired to out witt most fisherman of our calibre. It was this time last season that we started to see these fish moving in for the summer and by November I had caught 2 over 7 lb from the braids. If you remember that client of mine Bill Boomer from Texas he caught his 10 lb TongariroÂ brown in October so don’t be surprised if fish start appearing in small numbers. I would notÂ be targeting these fish at the moment but trust me you will know when you have hooked oneÂ because in some cases a stiff broom stick wouldn’t stop them fromÂ them pulling you down to the backing in one solid run. If you ever hook one of these fish above 7lb it pays to have a plan in your head Â of how you are going to play the fish because if you dont he will leave you wishing you had done something different. Mike and I got smoked onÂ a regular basis last year and we have come up with the plan that if you hook one and you trust your knots and gear play them hard. Don’t let them go on those long fast runs towards the tail of the pool but try and turn their heads and keep them fairly contained where they were hooked. We lost countless amounts of fish last year and watched them dissapear down the Stag rappids simply because we let them get to much line out on us. I still get that feeling of a nervous wreck and shake like a leaf while fighting these fish and still get pissed of in myself when loosing them but that’s why I still love fishing and will do as much as I can between guiding. I fished yesterday with Gerald from America and had some good fishing before the wind got up and played havoc with casting. We hit the braids at about 7 30am, this is a little late for me but I had to go and get him at National Park which is 60km out of Turangi. Fish were caught in Spot X, Honeypot and in the Plank pool all on a fairly large orange glo bug. We fished with naturals for the first hour but did not start getting fish until we swapped over to a glo bug so they are still very much in favour of egg patterns. There were a mixture of hens and jacks but they had all been in the river for some time and the odd fish was even recovering and passing through back to the lake. The fast water held good numbers of jacks still chasing each other about butÂ they seemed very spooky and as soon asÂ a bad cast hit over them they were soon scattered. In a 4 hr session in the braids we did not see another angler which is very odd for that area, I suppose that is the benefit of fishing during the week at the moment. Dry fly this week has been productive in the evenings with good hatches at last light and anglers have all caught fish using small elk hair caddis type patterns. 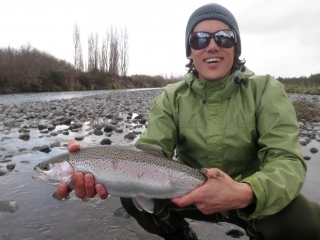 This is a huge turning point in our fishery and if this continues I’m sure anglers will once again be flogging to Turangi to be part of something as special as watching your fly being sucked under by a rainbow feeding heavily on one thing. Fish can be fickle at these times and matching the hatch is something that needs to be carefully thought about and executed with a high skill level. 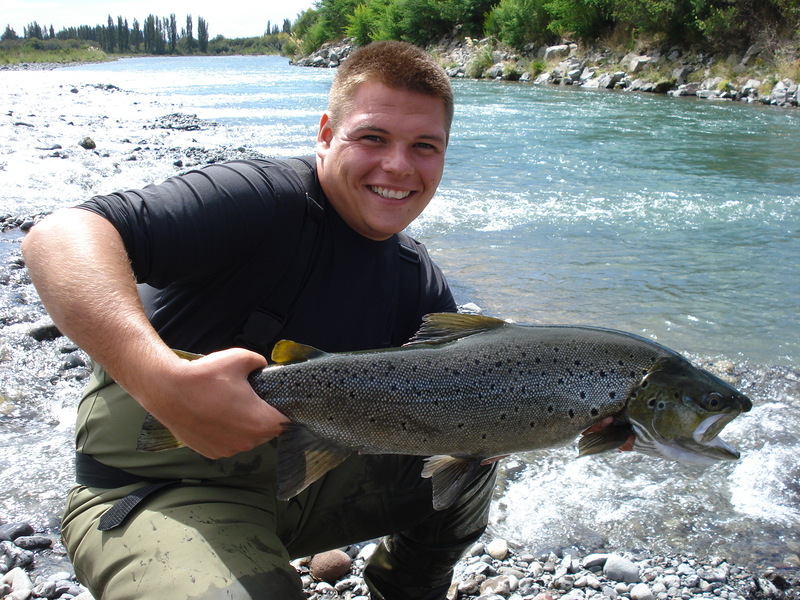 Remember when striking into these trout that if you don’t say www.taupotroutguide.comthe fly will not stick!! When going out for an evening rise be sure to use nylon not flurocarbon as fluro will sink your fly slightly. Fish fairly small drysÂ at the moment and look for pools with overhanging trees or banks as this will give insects a good place to escape the river and get to safety before being eaten. Always try and go out on a still evening with no wind, currently the wind is destroying alot of the surface activity unfortunately. There will be no recent photos forÂ Â a few weeks as I have fallen over and smashed the screen which has been sent away for repair. Expecting it back in 2 weeks so will snap away freely when it returns. God I feel lost guiding without a camera of late and consider it as part of my tackle these days.